Which AVI to MP4 Converter is the Best? The marketplace of AVI to MP4 video converter is becoming increasingly crowded. So it's refreshing when a video converter really stands out. Here in this article, we gonna share with you the best video converter to convert AVI to MP4 on Mac/Windows, as well as video converter freeware for iPhone iPad Android mobile devices. As the title suggests, in this part you will learn how to convert AVI video to MP4 with top three video converter software for Mac/PC. No BS, let's cut to the chase. 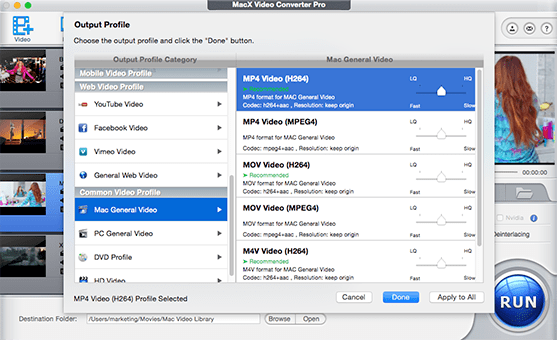 Start with the Top 1 - MacX Video Converter Pro. 1. Convert AVI to MP4 on macOS (Mojave) and Windows (10/8/7). 2. High Quality Engine, multi-core CPU, Intel/Nvidia/AMD GPU HW acceleration ensure AVI to MP4 conversion with original quality and 5X faster speed. 3. Directly convert AVI to iPhone Xs/Xs Max/XR/X/8/7/6s, iPad mini 4/Air 2, Galaxy S9 (edge)/Note 9, etc. 420+ preset profiles with MP4 (MPEG-4/H.264) file format. 4. Convert AVI video to 180+ video and 14+ audio formats like HEVC, 4K MP4, AVCHD, MTS, MKV, MP4, MOV, FLV, etc. 1. Download and convert online videos audio from YouTube, Facebook, Vimeo, Vevo, Dailymotion, Metacafe, Myspace, etc. 1000+ video audio sharing sites. 2. Powerful screen recorder to record anything on your screen conveniently, esp for the DRM protected video. 3. Transfer your collection of photos into a vivid photo slideshow video with music added. 4. Fascinating video editing software trim video, crop frame size, merge separate videos into a new one, add subtitles or watermark to personalize videos. How to Convert AVI to MP4 Video Using MacX? Free download the best AVI video converter software and fire it up. Click "Add File" button and locate the AVI files which you want to convert to MP4 format. Opt for MP4 as output format from the format list and you can also touch up audio and video parameters like Bit Rate, frame rate, resolution, aspect ratio, etc. as you wish. After finish the above steps, press "RUN" button to call the AVI files to MP4 conversion begin. PS: the same steps are applied to convert MP4 to AVI, MKV to AVI, FLV to MP4, etc. Note: After converting AVI to MP4 file format, if you still the output MP4 video is a tad bigger in file size, you can also apply this MP4 video transcoder to compress MP4 file size by adjusting its parameter settings (Bit rate, frame rate, resolution, etc), cut off the unwanted video parts of MP4 video or even convert MP4 to FLV, WMV, etc. with smaller file size. The second video converter I wanna introduce is the Mac-based MacX Free MP4 Video Converter, which can free convert AVI to MP4 super fast on Mac for playback on iPhone, iPad iPod, Blackberry, PSP, etc. Plus, this AVI to MP4 digital video converter also enables you to convert HD and SD videos to MP4, MOV, FLV, MP3, AAC, etc. like MKV to MP4, AVCHD to MP4, FLV to MP4, MOV to MP4 and more without effecting any video quality. Online Video Converter is a free online media conversion web application to let you convert AVI to MP4 with URL or downloaded video file. 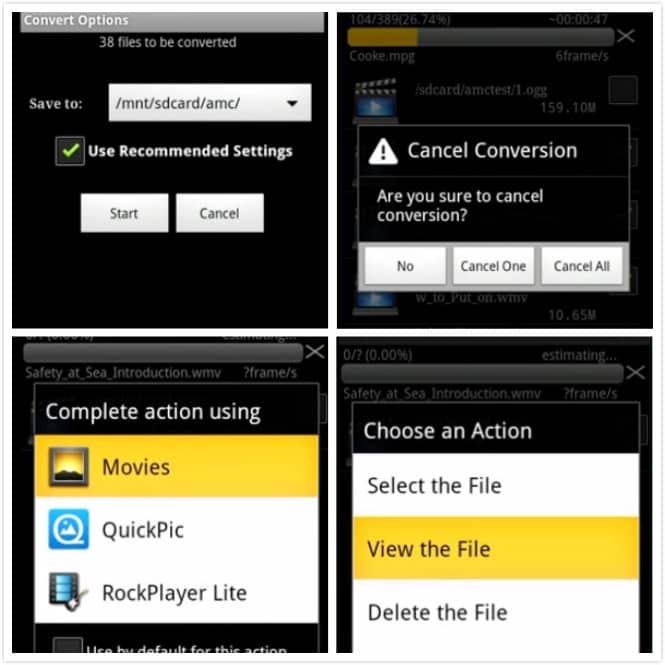 It's mentioning that it also offers support to convert AVI to various formats like MOV, MPG, WMV, MKV, MP3, etc. without plug-in or third party installed. And the operating process is quite easy to handle, only four steps needed. One drawback is that the AVI file uploading speed is a little bit slow, which takes me 2 mins to upload a 30-second AVI file. Of course, sometimes, its uploading speed is related with your computer configuration, web browser, connection speed, etc. Beyond transcoding AVI video to MP4 on Mac or Windows PC, sometimes you may have the need to directly convert AVI to MP4 on iPhone iPad with maximum convenience. Well, what matters is that iOS iPhone iPad devices only support MP4/MOV video files. For videos in incompatible formats like AVI, it requires a video conversion step first. This is what Video Converter App is mainly about. Here I will show you the best free video converter for iPhone iPad users to realize AVI footage to MP4 conversion directly on iOS device. That is iOS Video Converter, which allows you to easily transfer AVI from PC/Mac to iPhone/iPad/iPod touch, ready to be converted to MP4 on the device. There are two ways to get AVI files transferred: Wi-Fi Upload or iTunes File Sharing. The supported SD & HD video file formats include AVCHD, MKV, MTS, WMV, MPG, MP4, MOV, VOB, 3GP, FLV, as well. After AVI to MP4 video conversion, the output video files are also easily accessible to other iOS apps like iMovie, Final Cut Pro, Apple TV, or other iPhone iPad apps. 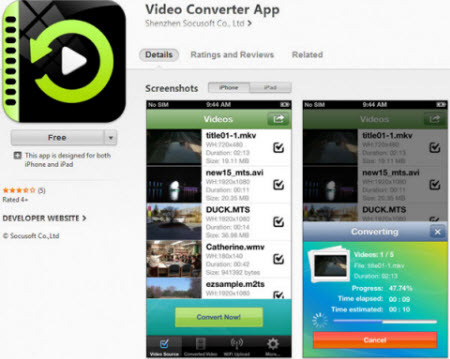 We just talk a lot about the free iOS iPad iPhone video converter, now it's time to recommend the efficient video converter app for Android. Here Video Converter Android is on par with what expect from the best Android video converter. Video Converter Android (VidCon) is the best (100% free) video converter on Android for Android to convert AVI to MP4 Android compatible format with zero quality sacrificing. In addition, this video converter for Android can convert various videos to MPEG4 and H264 videos, including FLV, MOV, MKV, MPEG, OGG, RM, WebM, etc. at one stroke thanks to its batch conversion feature. One more special point is that it can also compress and reduce video file size to send out through SMS etc. Also lossy compression tech; still keep superior high quality.